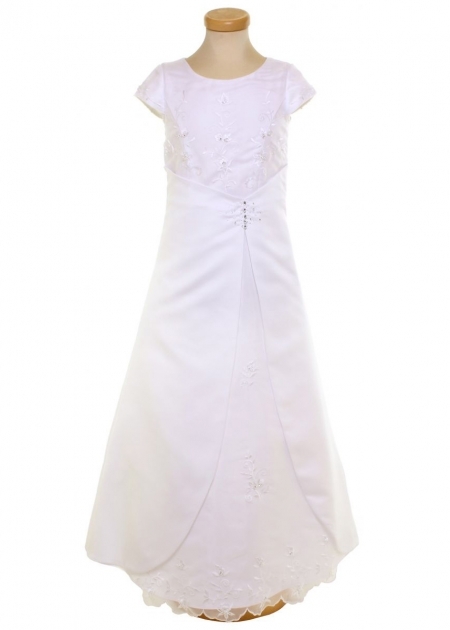 This communion dress is full length and comes with a matching bag. It has organza overlay covering the front chest, lower front of the dress and the rear upper back of the dress. The organza is embroidered with beautiful flower embroideries. Slightly to the left side of the waist is decorated with a row of diamantes, which forms the centre for two pieces of satin skirt overlay that flair out to the sides. The dress is fully lined and zipped at the back. 7 Yrs 25.5" 23.5" 42"
8 Yrs 26.5" 24.5" 43"
9 Yrs 27.5" 25.5" 45"
10 Yrs 28.5" 26.5" 47"